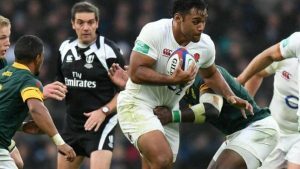 When England start the defence of their Six Nations title against France today at Twickenham, they will have Billy Vunipola’s prayers, if not his 19st 12lb presence on the pitch, for “Le Crunch”. He has become one of the stars of Eddie Jones’s resurgent team, but is on the sidelines with an injury until March. “I’m sure I’ll say a prayer, not for the boys to win, but that they play their best and are protected,” he says. Vunipola, 24, a back-row forward for Saracens and England, is a committed Christian along with his older brother, Mako, who is also a professional rugby player. Billy made his England debut in 2013 and has won 32 caps. While he has become an influential player on the pitch, he does not believe in preaching to his team-mates. “They will all know I have my faith, but that it’s personal to me. I would never say, ‘Your life is not good enough, this can change your life.’ If I am kind and forgiving to them, all the things it says in the Bible, they’ll say I want to be like that,” he says. He mentions Anthony Watson and Maro Itoje as others in the England squad with a strong Christian identity. Although there is no official chaplain to the England rugby team, support has been offered during World Cup tournaments, when the players are away for a longer period. Vunipola’s faith has been influenced by his family and upbringing. He grew up in Tonga and Sydney and moved to the UK when he was six as his father, Fe’ao, was pursuing a rugby career in Wales. His mother, Singa, originally an accountant, retrained as a Methodist minister. Her ministry is in High Wycombe, Buckinghamshire, but Billy tries to attend a local Methodist church in Hertfordshire on Sundays when rugby commitments allow. He faced a particular low in 2014 when his club lost the European Cup final. “I came crashing down to earth. At the time, I was going to church and being selfish. The only thing I was praying about was me,” he says. Christianity was pivotal in helping him through this. “I am a better person in rugby and life. God has redirected me to a better situation,” he says. He reveals that a number of players in the Saracens dressing rooms have religious faith, but prefer to keep it private. They value the pastoral support that a chaplain can bring. As well as Saracens and Cardiff Blues, in the English Premiership Harlequins, Worcester Warriors, Northampton Saints, Sale Sharks and the Exeter Chiefs also have chaplains. The Rev David Chawner, who works for Sports Chaplaincy UK, admits that there are gaps in the English Premiership and ruefully discloses that Scotland has not embraced rugby chaplaincy. He was disappointed that when England hosted the World Cup in 2015, the organisers declined to have a formal chaplaincy programme. We are a long way, however, from the situation in Ireland, where many players in the Celtic League are religious. Chawner points out that Ulster could turn out a full team of 15 who are religious. Vunipola is one of a handful of South Island descent in English rugby. Many of the players hailing from Tonga, Fiji and the like tend to be religious. Dan Leo, a former Samoa international, has worked in support of the welfare of Pacific Islands players. He estimates that there are 72 South Islanders in the Premiership and more than 130 in the lower divisions. Nearly all these players identify as Christians, even though they may not be practising. Vunipola hopes to be back playing before the end of the Six Nations. He is confident England can win, but whatever the ups and downs of the coming games, his faith should hold him steady.